Many people think of summer as a time for vacations, enjoying the outdoors, and relishing the long, lazy days. 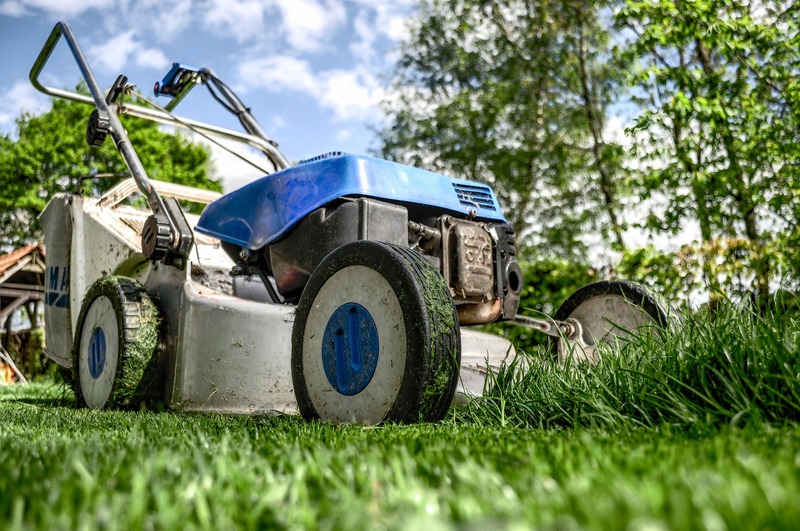 But in some industries, such as construction and landscaping, summer is anything but a time to take it easy. Instead, it’s the busiest time of the year. That means that vehicles, equipment, and other assets that have gone unused during the cold months will be called upon again. Before they can be used, they will need to be inspected to ensure they’re in good, safe working order. And they’ll need to be regularly inspected as they’re used to ensure they continue to be safe and operate as they should. If you use inspection checklists such as The Checker to facilitate your inspections, now’s the time to order more if you don’t have them for the assets you’ll begin using again—or if you don’t have enough to get through the summer. 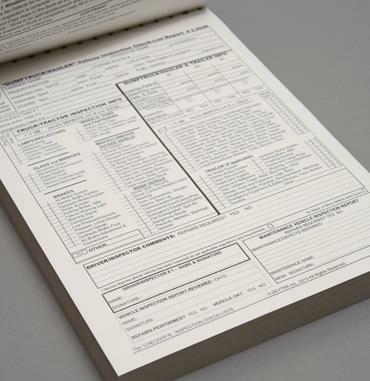 The Checker inspection checklist books are designed to guide personnel through inspections of hundreds of different types of assets, with detail specific to each type of asset. They make it easier for personnel to conduct audits or inspections, while increasing accuracy and providing documentation of compliance with internal and regulatory standards. If the assets haven’t been inspected over the winter, The Checker can serve as a reminder of what to check for each asset. And for personnel who’ve never used the assets, the checklists can educate them about what needs to be checked. In those industries where summer is the busy season, there’s a lot to do to prepare for the heightened workload. Don’t forget about the inspecting you need to do, or the tools you need to do it the right way. The Checker inspection checklists make it much easier to prepare assets for increased work during the warm part of the year. If you don’t have them in stock, order now. Motor vehicle safety is one of the most critical aspects of occupational safety for most businesses. You don’t have to operate a huge fleet for it to be vitally important. For evidence of that truth, consider this fact: From 2003 to 2012, according to the U.S. Department of Health and Human Services, work-related motor vehicle crashes killed 18,716 U.S. workers, more than any other work-related cause. It’s important to note that 16% of those deaths occurred off public roadways and 18% were pedestrian worker deaths. Whether it’s on-road or off-road use, any business that has employees operating motor vehicles is vulnerable to the consequences of unsafe vehicle use—fines, liability, and the host of costs that come with on-the-job accidents or fatalities (work disruptions, worker’s comp premium increases, administrative/management time, etc.). It doesn’t matter whether you have personnel driving big rigs across country, back hoes or pickups across a job site, or sedans to the next sales meeting, you need to take steps to create a motor vehicle safety program that minimizes hazards and risk during that driving. For a motor vehicle safety program to be effective, it must have support at all levels of management, starting at the top. This support must not be in word only; it needs to be backed up with meaningful rewards for safe behaviour, as well as with consequences when safety is neglected. 2. Provide training on motor vehicle safety. Best practices for safe driving. Relevant laws (speed limits, seat belt use, load weight, etc.). Specific safety measures to be taken for the vehicles they’ll be driving. How to recognize defects in the vehicles they’ll be driving. This training should be periodically reinforced with “refresher” training. When drivers have been at fault in an incident or have demonstrated unsafe behaviour, they should receive corrective training as soon as possible. 3. Develop processes for continuous improvement. On a set schedule, collect and review data about your company’s motor vehicle safety, looking for areas where improvement is needed. Whenever an incident occurs, investigate it as matter of course to see if policy or procedure changes could have prevented it. 4. Don’t let unsafe drivers drive. If you’re hiring someone for a position that will require a lot of driving, avoid candidates with bad driving records. Periodically review motor vehicle records to identify drivers who have violations that indicate they need more training in safe driving. 5. Implement a pre-use and post-trip vehicle inspection system that personnel must follow. Using an inspection checklist system such as The Checker, you can prevent unsafe vehicles from being operated. Inspections should be required, even when not mandated by law. Personal vehicles are not exempt—if they’re being used for business, they should be inspected because all the risks to the company are still present. 6. 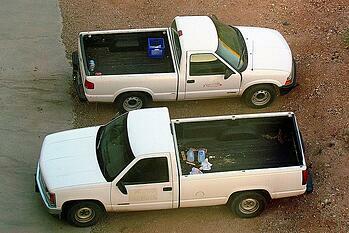 Require operators to keep their company vehicles properly maintained. Understand how maintenance issues can lead to accidents. Know how to report maintenance issues and have the means to do so. Be assured that the company truly wants these issues reported and will act on them. When supervisors are scheduling tasks that involve operation of a motor vehicle, they need to allow enough time for the operation to be at a safe speed. 8. Ban handheld use of phones, tablets, GPS devices, etc. while driving. Distracted driving leads to unsafe driving, and it’s not just texting that can distract vehicle operators—simply trying to answer the phone or make a call can do it. You may even consider banning phone conversations of any sort while driving. If alcohol and illegal drug use is a problem, you obviously need to get that driver from behind the wheel on the job. However, much work-related impaired driving occurs because of legal prescription drugs. Therefore, require drivers to report any prescriptions they are taking so you can determine if they will affect their driving competence. Drowsy drivers are not safe! Carefully follow all rules regarding driver rest and implement your own rules if necessary—and then enforce those rules diligently. It only takes a second of nodding off for a tragedy to occur. Neglecting motor vehicle safety is a mistake that can have major negative repercussions—in both a human and business sense. Whether you have a fleet of thousands of vehicles, or only a few, it’s wise to develop a motor vehicle safety program to minimize risk. Image courtesy of Sergei Scurfield, Creative Commons. Dave is interviewed by David Wojcik, who is a fellow entrepreneur and the host and executive producer of BiZ TV Canada. BiZ Radio Canada is a new venture of BiZ TV Canada. We’re excited that Dave was asked to discuss the dangers lurking in most workplaces and how the risk of occupational injuries can be reduced. The discussion will be beneficial to anyone concerned about avoiding the human and financial costs of dangerous working environments. In our 25 years of helping businesses improve workplace safety, we’ve observed that companies that regularly conduct equipment inspections are generally more profitable than those that don’t. Yet a perception remains that equipment inspections are all about compliance. This preoccupation with compliance is understandable. Depending on the location and industry, companies may be required to inspect certain equipment on a mandated schedule. When you’re required to do something, it’s natural to think you’ve accomplished what you’re supposed to do when you fulfill the requirement. But take a look at top-performing companies. You’ll see that as a group they inspect more often than required and that they inspect equipment not even covered by regulations. Their treatment of inspections as a vital business process shows that they realize that equipment inspections produce benefits beyond compliance. They know from experience that costs are reduced and productivity increases when inspections are done thoroughly and results are acted upon appropriately. Equipment checklists such as The Checker for ensuring accurate identification of equipment problems. Procedures for timely communication of inspection results to the maintenance department. Management support that includes consequences and rewards related to how well inspection procedures are followed. Such a program can achieve multiple business benefits. Lowering the costs of workplace injuries. Increased group health coverage premiums. In addition, regularly looking for safety issues while conducting inspections tends to increase overall safety awareness among personnel, which is fundamental in lowering workplace incidence rates. Reducing job interruptions due to equipment failure. When equipment inspections are regularly performed, problems that could cause equipment to fail are identified before the equipment is deployed and a job process is in place. When a necessary piece of equipment breaks down during a job, it’s common for other pieces of equipment to also become idle. Jobs are slowed, and personnel often end up being paid for unproductive time. It’s much better to identify problems for maintenance attention or repair and schedule jobs, labor, and replacement equipment accordingly. Fixing equipment problems before they become more-expensive problems. Equipment problems tend to escalate. One problem not known about or left unattended can lead to other problems. If the problem eventually leads to failure in the field, the result is the safety-related and productivity costs discussed above. And once failure occurs, replacement is often more expensive due to time pressures. When pre-use equipment inspections reveal problems—and those problems are immediately communicated to maintenance personnel who can take action—equipment can receive the attention it needs when it can be most effective, at a lower cost. Providing documentation for protection against liability exposure. If a workplace injury or fatality occurs, you can be in compliance but still be found negligent. When using an equipment checklist such as The Checker, the checklist provides evidence that inspections have been performed, which can prove to be invaluable in defending against liability claims. 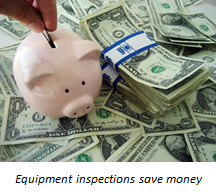 A systematic program of regularly inspecting commercial equipment will not only provide compliance with regulations, it can strengthen a business by lowering costs, reducing negative effects on productivity, and guarding against liability risk. Image courtesy of 401kcalculator.org, Creative Commons. Vehicular accidents are a leading cause of occupational injuries any time of year, but winter heightens the threats. Winter brings icy roads, snow that blocks road and limits visibility, and extreme conditions that are rough on vehicles. That makes winter’s arrival an ideal time to reinforce basics of vehicle safety, while emphasize safety measures that are particularly important this time of year. Whether your company operates a large fleet of big rigs or only a few vehicles, the following four steps will help you protect your personnel and vehicles this winter. 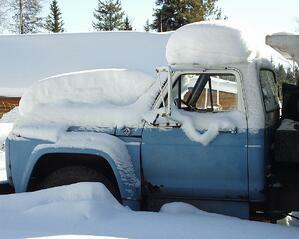 Anti-freeze is an obvious item to check, but you might as well check all fluids while you’re doing that. Ideally, you should be inspecting fluid levels regularly throughout the year, but winter is a particularly perilous time to overlook fluid deficiencies because vehicle failures in winter storms can leave people stranded in perilous situations. Also be sure to have appropriate snow tires, and check to ensure the correct tire pressure for icy conditions as specified by your tire manufacturer. Any vehicle used in business should be regularly inspected to identify problems that need repairing before they become safety hazards and/or more costly to repair. Using vehicle inspection checklists such as The Checker, you can proactively identify items for preventative maintenance. In winter, however, the need for regular inspections is especially acute because the extreme conditions of winter take a toll on vehicles and make breakdowns potentially disastrous. Regular inspections aren’t enough, though. The results of the inspections must be communicated to the maintenance department before any problems can be fixed! Focus on ensuring ongoing, complete communication of potential vehicle troubles to maintenance. Vehicle safety should be an essential part of training for any personnel who operate vehicles on the job. But it’s a good idea to remind everyone of how wintry conditions will affect the way they will have to drive in order to be safe. Emphasize the importance of safe following distances and go over techniques to best manage vehicles in ice and snow. If a vehicle breaks down, becomes stuck, or is involved in a wreck during a winter storm, there’s a strong possibility that help may not be able to arrive for some time. Winter storms also lead to road closures that can leave motorists stranded in their cars for hours. A tow rope or chain. A non-perishable emergency food supply, with a can opener and pocket knife. Extra clothing and winter footwear. A candle and holder (e.g., a tin). Road flares, a bright cloth to use as a flag, and a “Call Police” sign. Vehicle safety in winter depends on vehicles being inspected and repaired to ensure safe operating condition, drivers being attuned to the risks of winter roads, and vehicles being equipped with necessary emergency provisions. Let’s face it—no matter how good your safety polices are, the level of safety at your company will ultimately be determined by the attitude of your personnel. Above all, safety is a mindset. Policies are just words—if they’re not followed, they don’t keep people safe. It takes personnel with the right attitude to turn safety policies into real safety. When a company reaches a best-in-class safety level, you’re certain to find a genuine appreciation of safety among operations personnel, the people who are most often in danger’s way. They are diligent about safety out of a sense of self-protection, as well as a desire not to hurt others. Here are four signs of such a safety mindset among personnel. 1. They use their equipment as it’s meant to be used. If personnel have bought into safety, they habitually inspect equipment before using it to make sure it’s safe. Then they invariably follow all instructions for safe operation. They never take dangerous “short-cuts” or use equipment in ways not intended. Moreover, they will always wear the necessary safety equipment. They do things as they’re supposed to be done, as a matter of choice. 2. They’re aware of their surroundings. Safety doesn’t take place in a vacuum. Every situation is different, with unique hazards and unexpected dangers that can arise at any time. Personnel with a safety-first mindset proactively keep an eye out for safety issues. They’re like excellent “defensive drivers”—keeping themselves and everyone else safe by always focusing on the road ahead and avoiding potentially dangerous situations. 3. They’re aware of their limitations. In companies with safety cultures, when personnel are tired, they take a break. If they are sick, injured, or mentally stressed on a particular day, they are honest about it and don’t put others at risk by trying to do a job they’re not up to. Even if they’re feeling great, they recognize when something’s beyond their ability to handle on their own, and they seek help. The key is for personnel to be serious enough about safety that they are willing to immediately acknowledge any problems they’re having that could cause them to be unsafe. This is one of the areas in which management support is essential. Personnel must feel secure and comfortable in revealing their limitations; otherwise, they are likely to push ahead even if they know they’re not 100 percent. Personnel who appreciate the value of safety won’t hesitate to report safety issues they see during operations. They will not only consider it an obligation, they will understand they are protecting people. As with self-reporting of personal limitations, management must make sure that personnel are commended—not disparaged—for reporting safety issues. Companies that want to increase safety can’t ignore the attitude of personnel. Even with the best policies—and even with industry-proven tools for improving safety, such as The Checker inspection checklists—a company won’t have a best-in-class safety program if personnel aren’t fully on board with the effort. Image courtesy of Coolcaesar, en.wikipedia, Creative Commons. Devtra was founded in 1989 to provide equipment safety training to help businesses improve workplace safety. Twenty-five years later, we’re still helping companies become safer—although now we’re doing it with The Checker, the inspection checklist system we debuted in 2000. I think a key reason we’ve made it this long is that we genuinely care about safety. It’s something we’re passionate about, and I believe that passion comes through in our inspection checklists and in all our interactions with customers. When we were providing equipment safety training, we felt an immense responsibility to the people we were training. We realized that our instruction could save their lives one day. When we started The Checker, that attitude never changed. We accept nothing less than producing the best checklists possible because we know a properly conducted inspection can keep people from getting hurt. In 1989, the safety industry in North America was much different than in it is today. Occupational safety and health wasn’t even much of an industry. In Ontario, we had virtually no competition in offering training on equipment safety—and the situation in the U.S. was similar. Even in 2000, when we started The Checker, the emphasis on safety was far less than it is today. More companies realized the critical importance of workplace safety than they did in 1989, but not many appreciated the vital role of inspection programs in improving safety. Using checklists created by experts, designed for each specific type of equipment being inspected, was a novel idea. Increased public awareness of the social costs of occupational hazards has led to tighter regulations. Smart businesses are paying attention to the enormous costs of poor safety. 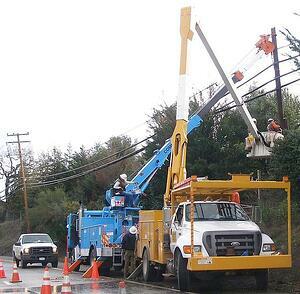 Industries and equipment have become more complex, often resulting in a higher level of danger. There’s a growing realization of the direct relationship between a strong inspection program and a high level of safety. 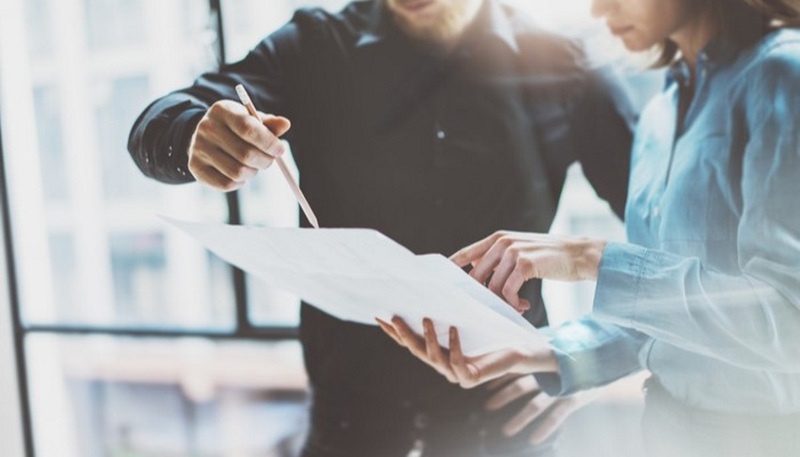 An increasing number of companies are appreciating the liability protection and regulatory good will that documented voluntary inspections can provide. The troubling reality is that safety still doesn’t get the emphasis it should among many companies, and the value of professionally designed, equipment-specific checklists is still not sufficiently appreciated by a lot of executives and safety professionals. But things are definitely getting better. You don’t last 25 years without adjusting to the times, and that’s what we’re going to continue doing. We’re very excited, for example, about how mobile technology can improve inspection processes, and we’ve launched The Checker Software in response. This SaaS service integrates mobile inspection forms with inspection management software. As industries, regulations, and technologies continue to evolve, so will we, using the lessons we’ve learned in the past 25 years to guide us moving forward. 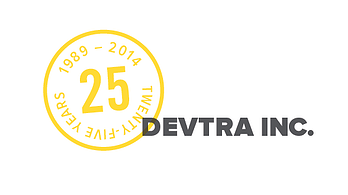 Devtra offers a big thank you to all the customers we’ve had the pleasure of serving over the past 25 years. We hope you’ll be a part of our next 25! If you haven’t tried The Checker yet, what are you waiting for? It’s simple and inexpensive to get started with this 21st century safety tool. Safety in business is nothing new. It’s as old as business itself. After all, safety is rooted in nothing more than our human instinct to protect ourselves. Complacency. Personnel become so comfortable with doing certain tasks that they forget about the dangers. Unawareness. Sometimes personnel and employers simply don’t realize the dangers that exist. How to counter these causes for poor workplace safety? A great way is to relate safety to personel danger. Go straight to the instinct for self-protection, reminding personnel that safety is in their best interest and to always be on the lookout for things that that can hurt them. This “protect yourself” strategy for promoting safety awareness is nothing new, either. It’s been used for decades, as evidenced in this video clip from 1970 about an unfortunate fellow who came to be known as “Three-Fingered Joe.” The video production may seem campy now, but the message is just as relevant today as it was then—poor safety often has tragic personal consequences. The sad reality is that there are still too many Three-Fingered Joes. If you want to minimize workplace injuries and their substantial costs, it’s essential to have safety training tailored for each type of equipment your company uses. Every type of equipment has its own unique safety risks, and personnel can’t possibly be safe if they’re not well aware of those equipment-specific risks. Inspection checklists can be a great help with this training—if the checklists have all the detail necessary for each type of equipment, with all items listed in logical circle-check/walkaround order. Such a safety inspection checklist (e.g., The Checker) essentially becomes a “textbook.” Trainees simply follow the checklist to learn how to ensure their particular type of equipment is safe. Safety training is an ongoing effort that must be backed up in the field by mandatory processes that genuinely increase safety (and thereby gain the respect of personnel). These processes are training in themselves. Personnel need to go through safety steps over and over to internalize the importance of safety and ingrain safe habits. Once again, inspection checklists offer assistance—they are one of those “training” processes. They have a real, immediate effect on safety while reinforcing safety training. Continually using safety checklists drives home the safety message. You can find many resources to help with your safety training, including equipment-specific training materials from The Checker. Ensure all safety trainers are adequately prepared to instruct—fully understanding how the equipment works, how it’s used on the job, the risks it poses, and the appropriate safety measures to take. In addition to general workplace safety training, provide new employees with training specific to their job function and the equipment they’ll be using. Require processes (e.g., pre-use inspection checklists) that work to directly ensure safety while also building safety awareness. Require personnel to periodically receive additional safety training and review. Clearly demonstrate to all personnel that safety is a core company value! To reduce injuries and safety-related costs, safety training programs should include training for the specific types of equipment personnel are using. Inspection checklists can be a valuable tool in providing and reinforcing this training.